I won’t tell you how disappointed I was when I learned that “quinoa” is not pronounced phonetically, but is pronounced ‘keen-WAH’ . Saying ‘quin-OH-ah’ sounds so much more elegant, almost more apt for such a small, delicate grain. But what quinoa lacks in size it more than makes up for in nutrition. It is a powerhouse! Tons of protein and fibre can be found in this ancient grain and it adds some interest to the plate since it changes things up a bit as a nice alternative to rice when served hot. 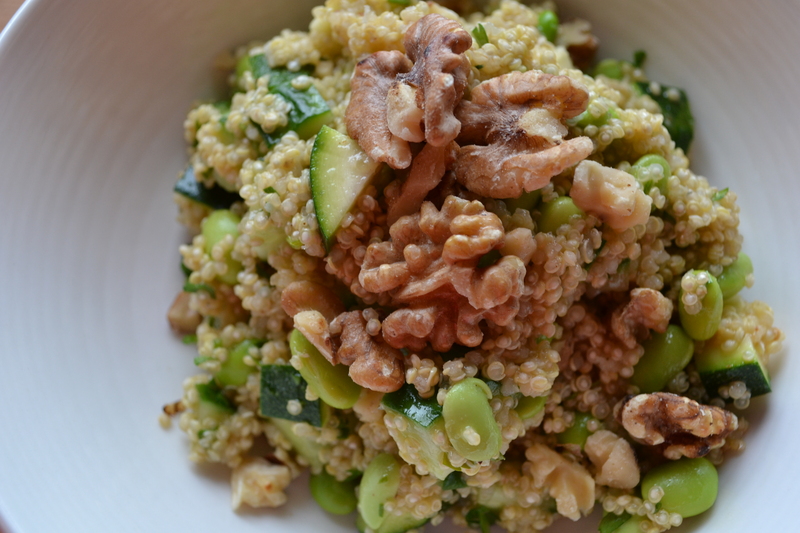 Here it stands in for cous cous in a cold tabuleh-style salad. This is great on its own as a light meal but would also go well with meats or fish. Cook the quinoa in 1-1/2 cups of water, as you would rice. . While it cooks, chop the vegetables and walnuts and set them aside. Make the vinaigrette in a large bowl by combining all the ingredients and whisking until it is emulsified. 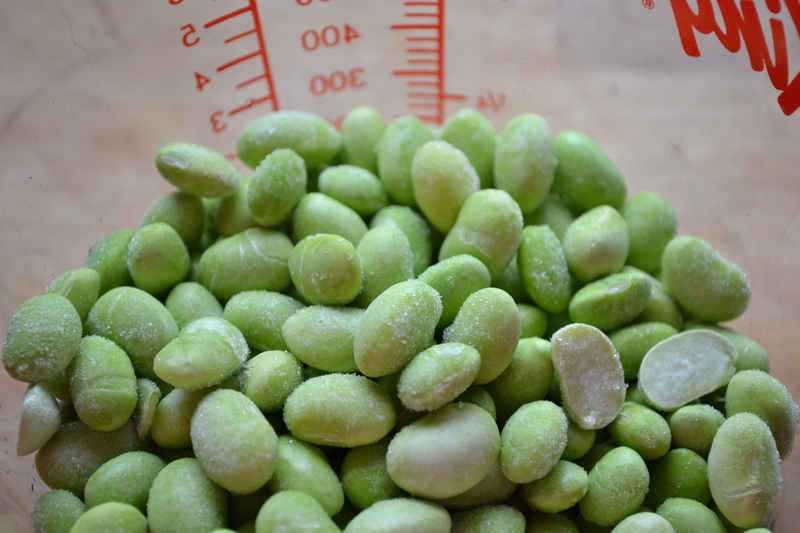 If your edamame are frozen, like mine were, let them stand in hot water (hot from the tap) for a few minutes. This will not cook them, but will defrost them rather quickly. 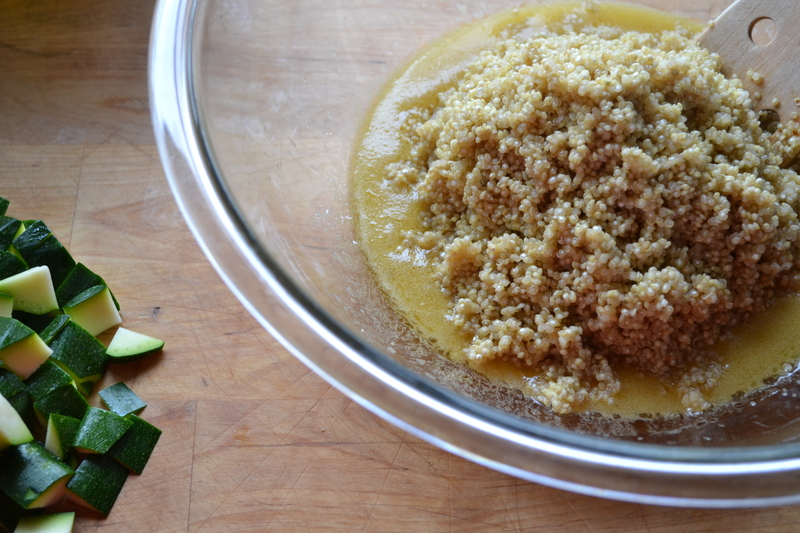 Once the quinoa is cooked, dump it into the dressing and stir well. Allow the quinoa to cool and absorb the dressing. Once it’s room temperature, add the vegetables, walnuts and parsley. Correct the seasoning with salt and pepper if needed. Toss well and refrigerate for atl east 30 minutes so it is nice and cold.